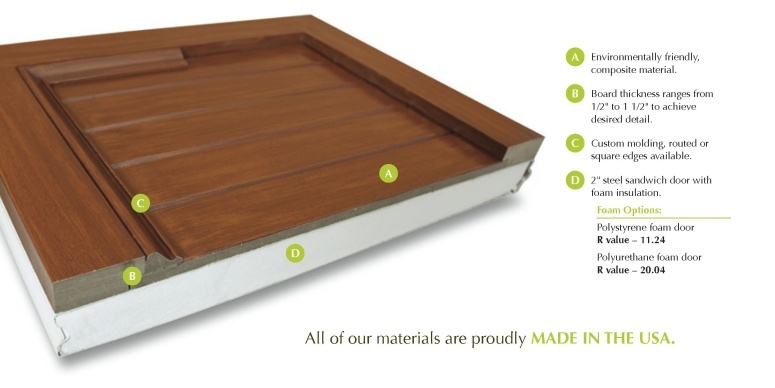 All of our doors are manufactured with composite materials. This composite material has established itself in the marine industry for years. It has stood the test of time in both saltwater and fresh water boating applications. We work this material exactly like we would with wood to give our doors the true architectural appearance of wood. It does not, however, have the issues that come with wood products. Our material will not rot, invite termites or mold, and it performs well under all types of weather conditions. It can also be up to three times lighter than comparable wood products. A lighter door means less wear and tear on the hardware. For more information on our materials please contact us. Our manufacturing process utilizes state-of-the-art CNC machines ensuring product consistency and accuracy at all product levels. Our doors are produced on both residential and commercial vinyl-backed or sandwich sections that can be wind loaded to our customer’s particular needs. We use only upgraded commercial hardware on all door applications. Our overlay is fastened to the doors using a hot melt adhesive designed for our particular application and is then reinforced with mechanical fasteners. Standard and custom doors are drawn in CAD software and delivered to clients prior to construction, ensuring that our doors meet the particular design requirements. We continually monitor and test our manufacturing process to ensure all materials used are the most technologically advanced products available. Feel free to review our frequently asked questions concerning the construction of our doors. Our unique finishing techniques allow us to offer traditional wood colors such as cedar, oak and mahogany, as well as five other standard colors. At Eden Coast, we are setting a new standard in pre-finished doors. We offer a proprietary stain and paint finish and boast 8 standard stain options in both a wood grain and smooth texture. Please review our stained and painted galleries for samples of our latest work. We also custom-match many types of wood and finishes. We offer pre-finishes in a variety of solid paint options, including metallic paints. Our pre-finishing process consists of four steps, a process that is not just superior to industry standards, but is of the same quality as an industrial or automotive finish. Our finishing options allow every customer to truly customize any door with their own uniqueness. After years of experience and continual monitoring with our suppliers, we have developed our unique finishing techniques. Our 4-stage finishing process provides protection from environmental conditions, while bringing out our desired color variations. Throughout the process we use multiple coats at different stages to create the desired finish. Our process is continually monitored, and we work closely with engineers on a regular basis to ensure our process and materials are the most up-to-date and provide the best protection available. Please feel free to review our frequently asked questions concerning our finishing processes. Our doors are hinged prior to manufacturing and during the manufacturing process to ensure proper alignment. Universal overlay material is also randomly pulled and compared with doors in production to ensure consistency. We also weigh every door when completed to ensure that springs are ordered based on every door’s actual weight. These steps help us to guarantee functionality and consistency.